Last Updated: 15th of November, 2018. We always want to make most of the technology we acquire, let it be a daily use stuff or anything from the tech-world, withal, it does not stop here, people also want things to be done in nothing flat, plus smoothly as ever. Same is the scenario with the technology enthusiasts, hence the operating systems are designed to work efficiently but they are often snaillike for the complex applications. Thus, to run such programs, the technical guys seek the sustenance through “overclocking” the processors, as they are the logic circuitry, responsible for the execution, decoding, and multiple other functions. Well, the computing devices have various processors fixed in them, Central processing unit aka CPU is one of them too. What’s the Need to Overclock a Computer? 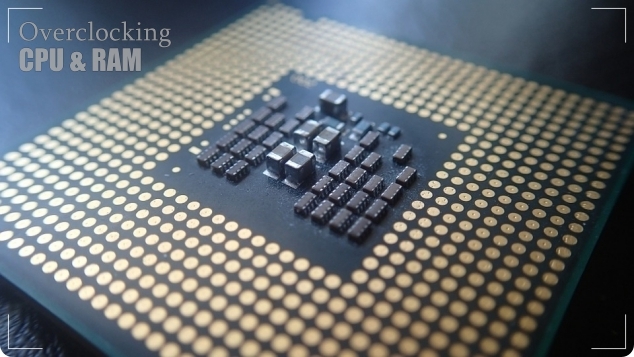 CPU is the electronic circuitry present in the computer it is responsible for conveying the commands of the computer programs or applications. We are well aware that the Computers themselves are not lackadaisical, multiple constituents contribute towards this factor, normally they work at a fair speed, but overclocking pushes them to work in an accelerated manner, way faster than the normal velocity. It is ideal to overclock the CPUs when the user carries out the complex tasks using the system, not every program runs smoothly in the normal speed, so setting up the CPU multiplier higher, helps with the programs like 3D imaging and video editing, etc. People ordinarily confuse that overclocking is only ideal for gaming machines, well! It’s not the scenario. Overclocking might seem perfect to trigger systems, but it contains some drawbacks too, as the devices are being pushed forward to perform in the amped-up way their lifespan diminishes expeditiously. The systems with overclocking devices consume more energy, hence end up costing more. Also, one has to keep an eye on the voltage settings as well as the fan rotation as they can go up, Core Temp is a program which can monitor these on your behalf. Of Course, Overclocking is not as simple as it seems, further, it pushes your system much harder for the better performance, so keep on checking the system heatup, constantly. Overclocking is not an exact science it may work for your device, or it may not work for any of your companions, as not every piece of tech is formulated in a way to be overclocked, yet it does not clearly indicate that one must not try. Some factors are mandatory to be kept in a view while stepping towards overclocking; heat is the most crucial factor as it increases proportionally with the voltage, more the voltage, higher will be the temperature. Similarly, the energy goes up according to the overclocking velocity, but, not every computing device can cope with the high voltage. So, keep the eyes open before jumping into it, do some work beforehand to avoid any predicaments afterward. How to overclock the CPU? Well! It is not a piece of cake but only if you work in the right way, otherwise it can be a whole lot of mess, so follow the instructions below and get going. First of all, it is necessary to check the CPU whether it is performing efficiently while in the idle state as well as at the peak action time. As stated above another software will be required which can monitor the necessary number including the velocity, voltage as well as the temperature. Thus, grab a proficient application beforehand as it is eminently necessary. One more thing, to overclock the CPU it is necessary to check if your CPU is overclockable or not (as not all the processors can be overclocked) if yes, you just got lucky and a part of silicon lottery now! Enter the motherboard’s “BIOS”, to do so, shut down the system, turn it on again and keep hitting the Delete key over and over, this will lead towards the BIOS. Click on the “Advanced Frequency Settings”. There will be several headings below CPU Clock control. Head towards the CPU Clock ratio by clicking on it, hit the “+” Key to increase the numbers(Change Multiplier). Go to the Advanced Voltage Settings > CPU Vcore Loadline Calibration and change it to the Extreme (it will previously be on Auto). Make sure that any power saving modes are disabled. Log-in to the computer and get going. Transfer the BIOS from motherboard on USB, just to avoid any predicaments afterward. If you encounter the Black Screen, go back to the BIOS and increase the voltage. Again, Intel Processor can be overclocked using the application just like the AMD processor, however, in this case, the tech users will have to download “Extreme Tuning Utility”, this app will make ways that are required to overclock the processor, however it is necessary to keep an eye on the temperatures just be on safe side. How to Overclock the RAM? RAM (Random Access Memory) is one of the essential parts of the computing device as everything that the device’s processor receives is sent by RAM. So what if the data transmitted by the RAM reaches its destination way faster than the actual speed, yes! It’s definitely every tech users dream. People would speed up everything, only if they could. Run BIOS and head towards the DRAM settings. Click on “DRAM Frequency”, change the frequency from Auto to your desired number. Enter into the Advanced DRAM Configuration, do not mess with the options other than tCL, tRCD,tRP, tRAS, enter the timing and frequency combinations for each of the stick. Save the changes made and reboot. If the system turns ON, congratulations you have successfully performed the overclocking for RAM. Check the benchmarks and perform testing before overclocking as well as afterward, as it helps if the changes that have been made actually had any effect or not.